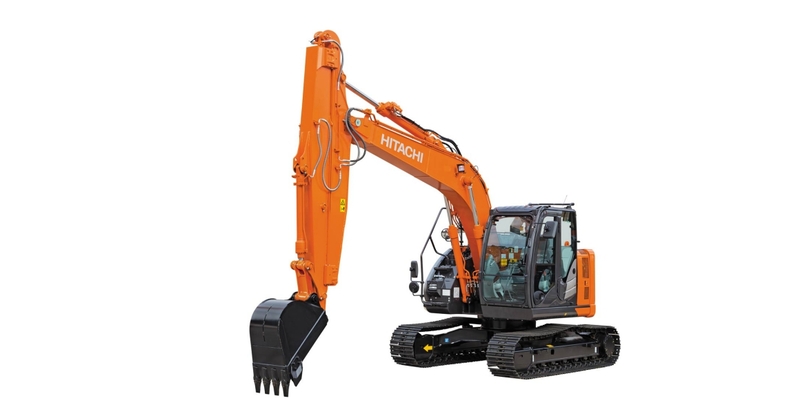 The new sliding arm excavator from Hitachi is ideal for deep excavation projects in confined spaces. It can dig deeper than a 30-tonne standard model and has a significantly smaller footprint, which makes it ideal for urban and road construction projects. The new special application model will be presented at Intermat by Payen, an authorised dealer of Hitachi Construction Machinery Sales and Service France SAS. The machine has been developed by Hitachi as a compact alternative to larger models, addressing the specific need for powerful machines capable of working in confined spaces. It can complete excavation tasks quickly and efficiently, enabling projects to be executed safely and on schedule. The sliding arm extends the working range of the ZX135US-6 considerably to a maximum digging depth of 7,790mm. The upper arm features a built-in sliding cylinder with a 2,000mm stroke. This makes it ideal for river maintenance, pipeline constructions and building mine shafts. In addition, thanks to the short swing radius of the ZX135US-6, it can fit perfectly in small spaces, which further enhances its versatility. The smooth operation of the sliding arm excavator also makes it suitable for slope finishing. This is thanks to the controlled combined operation of the boom and arm, and exclusive Hitachi hydraulic circuit. The machine’s robust sliding structure also supports the arm movement to prevent jolting and resists wear. The Zaxis-6 model is easy to maintain, with lubrication points on the sliding structure that also increase the machine’s reliability. The nylon sliding plates can be replaced quickly and conveniently. Handrails and a reinforced safety platform contribute to the machine’s safe working environment.